If only the three little bears had a sofa bed in their cottage, the fairytale might have had a happier ending and given Goldilocks a nice space of her own. But even she knows it can be difficult finding just the right piece of furniture. What’s the point of using a sofa bed that still feels like sleeping on a couch? Whether you’re looking to buy a sofa bed for your office, guestroom or regular bedroom, we’ve created a list of tips and tricks to help you sleep like Snow White. Too tired to walk after sprinting through a Riverdale marathon? Continue to Netflix and chill by choosing the best bedding mechanism to suit your needs. The type of device you choose will impact your budget, with click clack models usually being the most budget-friendly option. Click-clack: If you’re looking for something simple, the ‘click clack’ design is the most basic you can get – the term for the fold-out mechanism describes the sound it makes when converting a couch to a bed. Pull out: Open up the space by keeping the furniture compact, or pull out the bed using a discreet handle to transform the living room to a bedroom. Slide-out: Slide-out sofa beds are the Transformers of the furniture world, pushing the seat forward to create a bed without any gaps. There’s no one-size fits all when it comes to mattresses. From body type to budget, a variety of factors impact what you need for a quality night’s sleep. We’d recommend looking at the pros and cons of the different types of mattresses to see what’s right for you. Looking for something long lasting? Buying a foam mattress might mean sacrificing durability for comfort, especially when you start looking at options with higher density and firmness. Specialty mattresses or specialty mechanisms are alternatively available for people who need/want extra support. Snapping up a bargain might seem good at first, but the short-term gain might not be worth the long-term consequences of potential bad back support and general discomfort caused by poor mattress quality. This is especially the case for people who plan to substitute their normal bed with a sofa bed to cut space, or use the sofa bed on a regular basis or for extended periods. Sofa beds typically feature either a foam, memory foam, or innerspring mattress. Foam mattresses are said to be usually the most affordable and a more cost-effective option than other types of mattresses. But it’s also the most basic pick out of the bunch. Innerspring mattresses, on the other hand, are made with inner coils to mimic a regular bed. The coils are said to offer more support than foam mattresses, but this doesn’t mean that all foam mattresses don’t provide adequate support. Keep in mind foam mattresses are build thicker, which can contribute to comfortability. Sofa beds are usually constructed using two frames. One supports the shape of the sofa, while the other holds the mattress and allows the bed to be used. These are commonly available in steel and/or timber, with different materials offering varying levels of durability. The right frame should adequately cater to the dual function of a sofa bed. That is, to create a comfortable seating area and provide support for a restful sleep. If you’re worried about price, choosing a cover might play a big part in how much you end up paying. Many covers are made of either leather or fabric, with a variety styles and designs available. For a durable style that never fades, leather covers provide a classic design and are claimed to last up to 15 years. The material also softens with use, making it increasingly comfortable over time. The smooth surface has its advantages when it comes to cleaning. Provided the leather is well taken care of, dirt and spills are said to slide off. But leather can be high maintenance. It requires regular upkeep, which often includes dusting the sofa every week or treating the sofa with products such as stain guard protector. Plus, the price of leather usually isn’t cheap and can set you back at least $1,000. Picking a fabric cover is a more cost-effective option, and a wider variety of design options are available. The material is also suitable throughout the year, which might not always be the case for leather during those very humid and sticky days in summer. But prepare for spills, because fabric isn’t as resistant to stains as leather. Pet hair won’t be as easy to brush off, either. How much do sofa beds usually cost? You can’t put a price on a good night’s sleep – and it seems you can’t put a standard price on sofa beds. Costs vary depending on a wide range of factors such as material, size, mattress type, and upholstery. Leather-look click clack sofa beds can retail for $149, while a similar type of model made with fabric at the same store can sell for $429. Although if you want a high-quality sofa bed, a comfortable budget is said to be between $1,000 and $2,500. What sofa beds are available? Constantly falling asleep after streaming every season of Brooklyn Nine-Nine on Netflix? The Ikea LYCKSELE LÖVÅS Corner Sofa-Bed might be able to help you enjoy the best of both worlds. Retailing for $399, it features a firm foam mattress and is said to be suitable for two people. Keeping things fresh is apparently easy with the removable machine-washable sofa cover and dry-clean only mattress cover. More sofa-bed covers are also available for this product, so you can quickly swap covers and quickly return to the ever-important binge session. Having a small space doesn’t mean you can’t have overnight visitors. The Ikea BRÅTHULT Corner Sofa-Bed can feature in your living room as part of your everyday furniture, and occasionally moonlight as a foam guest bed. The item typically costs $549 and includes an additional footstool. This can be used to extend the length of the sofa, create another place to sit, or store extra blankets in the storage space available under the seat of the footstool. Otherwise there’s the Ikea Vallentuna Four-Seat Modular Sofa with Three Sofa-Beds. Similar to the BRÅTHULT option, this includes a storage area in one of the seat modules and can be converted in a variety of ways. Given the high $2,845 price tag, you might be happy to note the product is said to be made for everyday use and not just the occasional visit. People who want who love this collection can alternatively consider investing in the Vallentuna Sofa-Bed Module with Backrests. This is suitable for those who only need one freestanding sofa-bed, or want to add an extra module. You won’t be hitting snooze on furniture shopping once you’ve seen the sofa-beds at Plush. The Australian brand includes a small selection of leather and premium fabric options. Some of the collections currently available include Dex, Berlin, Archer and Architect. If you’re a fussy shopper, Plush might be worth checking out. Unlike some brands, Plush encourages you to customise each item to suit your own needs and preferences. Each ‘family’ has its own set of sofa-bed styles and cover types. You can choose from a number of configurations, such as a 2.5 Seater Sofabed or 3 Seater Sofabed, then pick the material and style of cover you want. The price all depends on the type of build and the type of leather you choose. 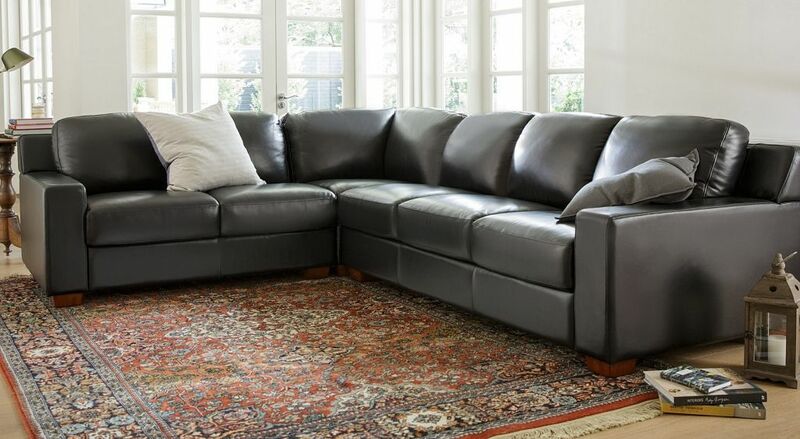 So, the Berlin 2.5 Seater Sofabed with Plush’s Elegance Leather cover can typically cost $4399. But the same option using Verve Fabric can cost $3199. Keep an eye out for sales throughout the year. If you’ve run out of luck at the shops, online retailers like Temple & Webster might be where you get lucky. The company sells a range of products from a variety of brands, including companies which are only located in a specific state or territory. It also has its own line of items, such as the fold-out Temple & Webster Aero Single Sofa Bed. This Scandinavian-style click clack couch is valued at $299 and can transform into a fold out sofa bed suitable for one person. The Temple & Webster Richmond 3 Seater Linen Chesterfield Sofa Bed offers a little more space. This is available in the Queen size and usually retails for $699. The frame of the click-clack sofa bed is made out of pine wood and plywood, while the upholstery is constructed using a linen cover and foam layer of silk floss on the padding. Unlike some sofa beds available, this particular model does not have a removable or washable cushion cover. But it can be cleaned other ways, such as by regular vacuuming or or wiping with a damp cloth. The Temple & Webster Brixton 3 Seater Chaise Sofa is a module sofa bed, the most expensive option in the brand’s own range of sofa beds. It usually retails for $1,299 and has an adjustable back to convert the bed into either a single or double. The arms of the chaise, as well as the piece of furniture itself, are also removable to provide versatility. Stuck on finding last minute essentials for an unexpected visitor? Kmart brings it home with its Multi Functional Sofa, valued at only $29. The inflatable couch is originally designed for camping, although it may double as affordable indoor furniture when duty calls. Suitable for two people, the Kmart sofa-bed is made of vinyl and has a coil beam construction. The cost of leather sofa beds usually sit at the higher end, generally at least $1,000. But there are plenty of brands offering models designed to mimic the aesthetic of leather furniture – without the killer price tag. One affordable alternative is the Iris Leather-Look Click Clack Sofa Bed from Amart Furniture, which retails for just $229. It uniquely offers multi-stage folding action, which is said to give you the option of choosing how far the back of the sofa bed goes. Another aesthetically-pleasing yet affordable option is the Sarina Fabric Click Clack Sofa Bed. 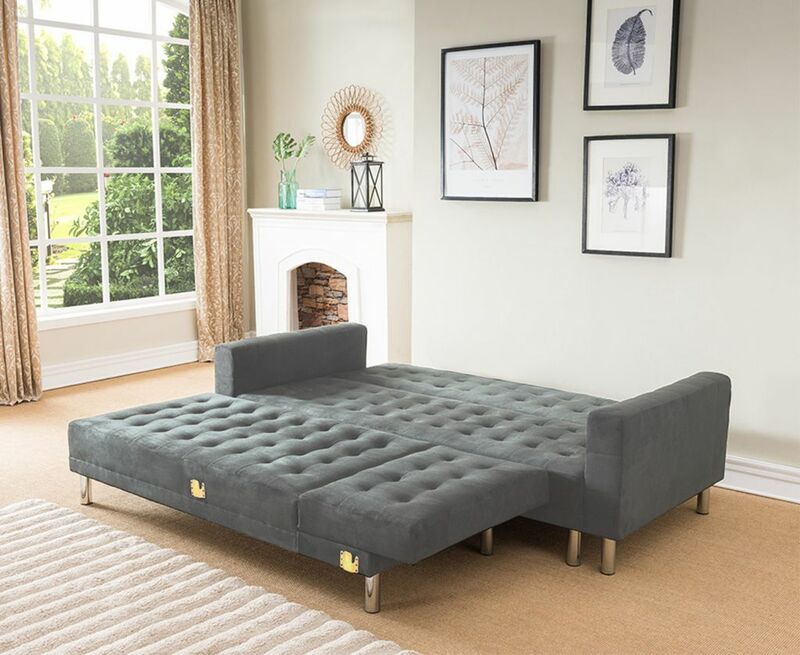 The $299 sofa bed is available in either sky blue or charcoal, and suitable for small spaces which might not have enough room to extend or fold out like other sofa beds. Since you now know what to look for when buying the best sofa bed, the decision shouldn’t keep you up at night.